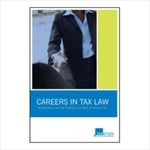 Careers in Tax Law: Perspectives on the Tax Profession and What It Holds for You is designed for those considering or beginning a career in tax law. This informative guide presents a series of offerings -- autobiographies in miniature -- by a broad cross section of working tax professionals. Each contribution stands as a unique story of paths taken, choices made, and lessons learned. Each adds to a composite portrait of the profession and its possibilities for the next generation of tax lawyers. In essays divided thematically into the following chapters, over 75 tax professionals share their unique perspectives, knowledge, and experiences. Nowhere else will you find such an honest and entertaining portrayal of the tax profession and what it holds for you. Professor Lederman's contribution is titled "It's Not Just Teaching." Lederman, Leandra, "Careers in Tax Law: Perspectives on the Tax Profession and What It Holds for You (edited by John Gamino, Matthew Ryan Sontag, and Robb Longman)" (2009). Books by Maurer Faculty. 47.